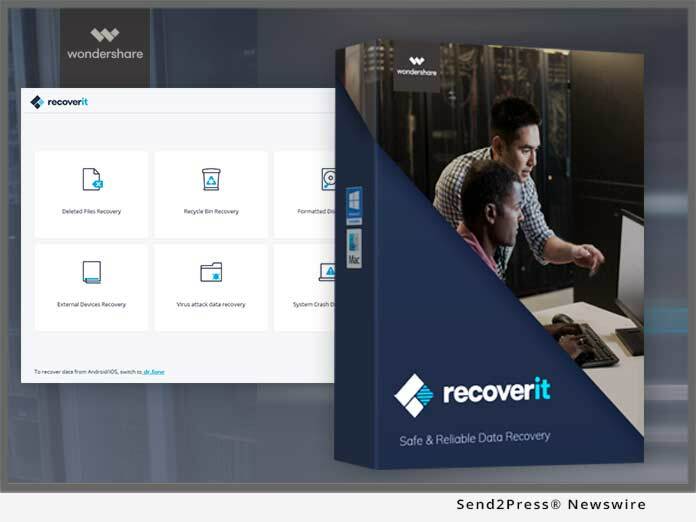 Adding more feathers to its cap, Wondershare has recently released an advanced version of its Mac data recovery software, Wondershare Recoverit for Mac 7.3.2, which supports encrypted-APFS file scanning and recovery. When the users lose vital information from their computer, taking every possible effort to recover the data is obvious. As least software applications venture towards retrieving lost data from your Mac, Wondershare Recoverit for Mac will ease that burden off your shoulder. The most unique feature about Recoverit for Mac 7.3.2 is it supports to scan and recover data from the encrypted APFS file system. This function is yet not implemented by any of their counterparts. Recoverit supported HFS+ files, but since APFS (Apple File System) has become the major file format for Mac recently, Recoverit for Mac 7.3.2 has adapted to support APFS. Although encrypted-APFS can have data secured much better because of its data encryption based on APFS, with the Recoverit for Mac 7.3.2 version, the users will get the opportunity to even recover lost file from encrypted-APFS, which was not possible in the previous versions. Though, Recoverit has a steady track record of recovering data, Recoverit for Mac 7.3.2 is going to set its own benchmark in Mac data recovery. Recoverit for Mac is a professional data recovery for Mac users, which is able to retrieve a variety of data types used on Mac computers including photos, documents, videos and the like, no matter what Mac version the user owns. Whether the data is lost due to virus infection, system crash or due to any other reason, Recoverit for Mac 7.3.2 does the data recovery job perfectly. On top of all, a non tech-savvy person can also use it effortlessly and get desired results. It can recover data on macOS and even from High Sierra 10.13. Encrypted APFS file recovery is supported by this software that no competitors have started doing yet. The kind of file formats it supports is amazing – AAC, AIF/AIFF, MID/MIDI, WMA, OGG, AAC music files; different email files such as PST, DBX, EMLX etc. ; ZIP and RAR files, various graphics and video formats as well as documents sum up the list. Whatever be the data loss scenario for your Mac, i.e. virus attack, from trash, deleted, formatted drive, external drive, lost partition, system crash or all round data, it can recover everything at ease. The process is very simple and intuitive to recover data, and there is no threat to data security. The Mac users can buy the software online by visiting the official website of Wondershare, select it from products and then make the purchase. Recoverit for Mac is available in three versions: Free, Pro and Ultimate. The Recoverit free can recover data up to 100MB for free. And Recoverit Pro and Recoverit Ultimate can recover unlimited amount data. Moreover, Recoverit Ultimate supports to recover data even though the PC crashes or unable to boot. Wondershare Technology is one of the prominent members of the National Planning Software Enterprises of China, well-known for its products including dr.fone, Recoverit, Filmora, and pdfelement. Being one of the leading application development companies in the world, they have a customer base across 150 countries. Their software applications are focused at simplifying people’s lives with their amazing solutions. They have their research and development centers in Tokyo and Shenzhen. Their marketing offices are located in Vancouver and Tokyo. IDG and Sino-Wisdom are among theirs investors.